You already set up your first Messenger Marketing Campaign, e.g. building your first chatbot. So what now? You want to gain some traction on it. This article is about different sorts of channels and entry points you can increase your subscriber list of your chatbot with. 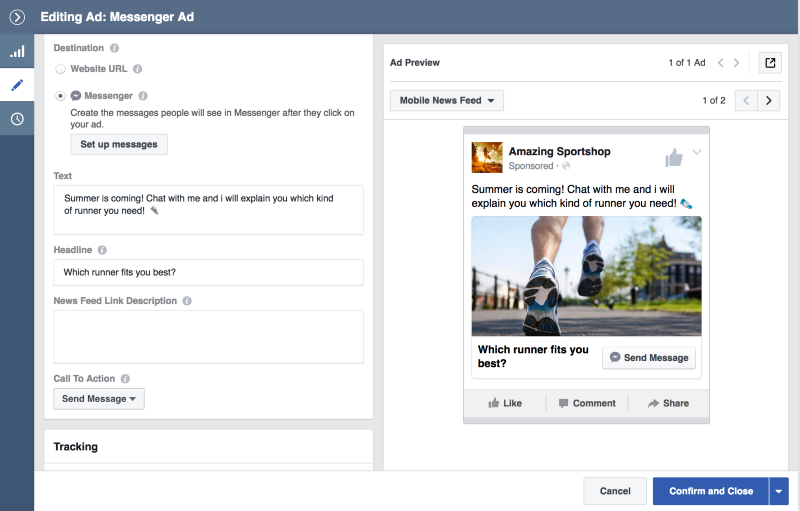 In the first part of the article I am introducing Facebook Messenger Ads. The second part will demonstrate some cool organic techniques how to grow your subscriber list without paying any money. 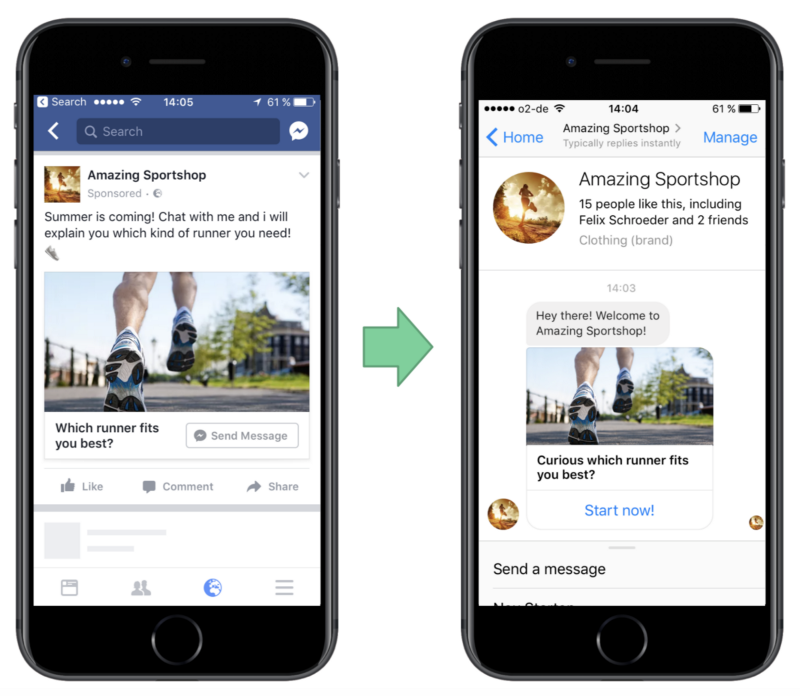 The most common (paid) practice to grow your chatbot audience is Facebook Ads. Traditionally in a News Feed Ad the Call-to-Action Buttons where something like Like our page, Download an app or Visit our Website. There is a new option now, which is called Send Message with Facebook Messenger as destination. Create a regular Facebook Ad with a video or image as the media and fill it with your promotional content. Be aware of the importance of ad text and headline as Messenger Ads are quite a new topic and many user do not expect to switch to the Messenger by clicking on an ad. Therefore it is necessary to prepare the user that the Messenger will open. Choose Messenger as Destination and select Set up messages to customize your welcome message. 3. You have several options for your first message you send to your user after the ad click. You can choose between Quick Creation or inserting a custom JSON. Using a JSON enables you to send custom templates like button or gallery templates within the first message. In my opinion the welcome message should ensure that the user understands what is happening and what he can expect from the chatbot. Therefore the Quick Creation of the welcome message is sufficient enough. In the screenshot below you see the Quick Creation Editor in the Ads Manager. Each welcome message can have an optional introductory text. Additionally you can choose between text, image & text or video. If you choose image & text you can also add a title and a subtitle for the image. The Call to Action of the welcome message can be a Quick Reply or a Button. In my example I chose the introductory text to welcome the subscriber to the chat. The image and the text below should then prepare the user what he can expect by starting the chatbot. Don’t forget to insert your payload into your button action if you want your bot to react to the button click accordingly. By selecting Preview in Messenger App Facebook will send you the welcome message and you can preview it on your mobile phone anytime. 4. Now you are ready to go. Launch you Ad and you will start growing your subscriber list. In my very first Messenger Marketing Campaigns I noticed a high drop rate (up to 80%) between the link click of the ad and the first interaction of the user inside the chat. You can measure that by comparing Unique Link Clicks with New Messaging Conversations inside your Ads Manager. I was very clueless how to improve the transition from the Facebook Ad to the Messenger. After a lot of testing with different headlines, ad texts and welcome messages I can say that is is necessary to ensure that the user knows what will happen. At any time. 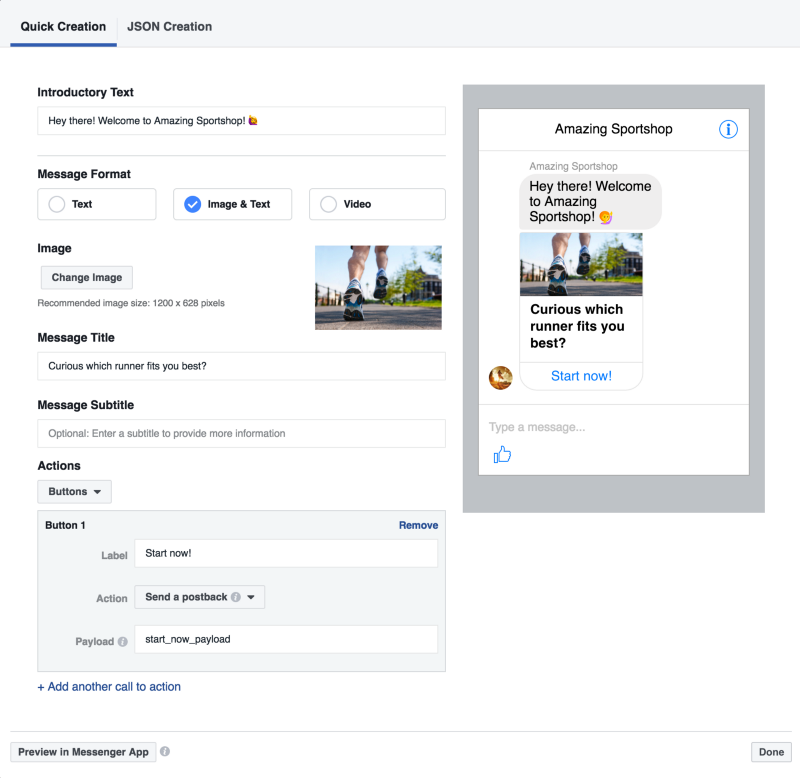 As most of the user expect to go to a landing page after clicking on a Facebook Ad you have to clarify inside the Ad Text that the user will move to the Messenger. Then the welcome message kicks in, which is the next critical part. michael wrote a really good article about which variables you can test within the welcome message to ensure a smooth transition between the ad and the Messenger. Thanks for reading and stay tuned, I will publish an article about organic growth options next week!